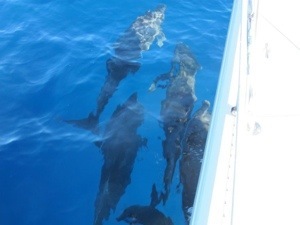 We have been out for right at two weeks now and have enjoyed glorious weather and beautiful anchorages. much of it entirely to ourselves. We’ve had clear, warm water, swimming, snorkeling and a fair amount of sea life. 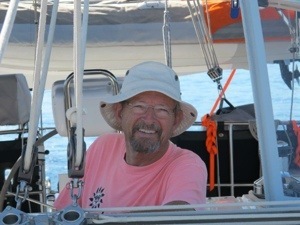 We were joined at Agua Verde by friends Rick and Pam on SV Hotel California and so added socializing to our activities. 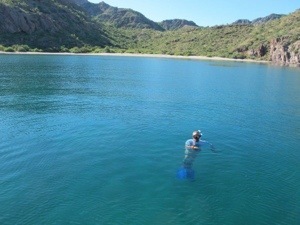 The SV Voyager crew (Bill and Julie) also stopped by Agua Verde and joined us one day. Each day also includes morning and (usually) evening HF radio nets. Some are on Ham radio frequencies but others are on marine frequencies instead but all are organized party lines of information sharing. Of paramount interest to all, of course, is the weather but they also permit one to keep track of other cruising friends. Who is anchored where, what are the conditions there, who’s on the move, etc. It makes for a nice community of sorts and folks you may never have met are “friends”. 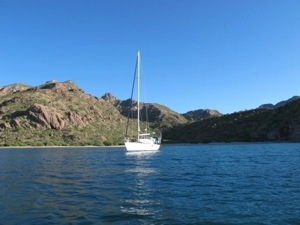 Here are a couple of photos of our life in the Sea of Cortez. LOVE the pictures. I haven’t been on this site before, so will follow your adventures this way.